You might know Carl Abou Samah as Canadian hip-hop artist and songwriter Karl Wolf. His remake of the Toto hit "Africa" was one of the most downloaded songs from iTunes in 2009. We find it interesting that, in an age marked by a gaping chasm of distrust between Western and Middle Eastern cultures here is an artist who has achieved prominence and built a following among both North American and Arabic youth. At night, young Carl Abou Samah's dreams were haunted by the terrifying vision of a soldier gunning a man down. For years he believed it to be a nightmare. Then at 16, he learned the truth from a visiting aunt. He'd witnessed the brutal killing of a man -- when he was only one-year-old. That was life amid the hell of Lebanon's civil war in the early 1980s. There is much Carl remembers from that time -- living in a bunker with his brother, hearing bombs fall outside, and the heroics of his father, who risked death to find food, and was shot in the back while carrying Carl and his brother to safety. You might know Carl as Canadian hip-hop artist and songwriter Karl Wolf. His remake of the Toto hit "Africa" was one of the most downloaded songs from iTunes in 2009. Since 2001, Wolf has been nominated for multiple Juno and MuchMusic Video awards, and has taken home honours from the Canadian Radio Music Awards and Canadian Urban Music Awards. He has also been named one of the 100 most influential Arabs in the world by Arabian Business Magazine and he tells us he receives emails every day from Middle Eastern youth inspired by his success. We find it interesting that, in an age marked by a gaping chasm of distrust between Western and Middle Eastern cultures -- especially in the years since 9/11 -- here is an artist who has achieved prominence and built a following among both North American and Arabic youth. With one foot on each side of the divide, Wolf believes he is an ambassador for Arabic culture in North America. It raises the question: can a popular music influence the international cultural perceptions of a new generation, creating better understanding between East and West? When Wolf was three his family fled Lebanon to Dubai in the United Arab Emirates. When he was 15, his family moved to Montreal, where he is now based. Wolf tells us he spent much of his youth trying to hide his ethnic roots. "I was really against being Arabic, I never really wanted to embrace that. Even in high school in Dubai I was always preparing to be a North American." On his first day at college in Montreal, when the teacher read out Wolf's name -- his true family name, Abou Samah -- four girls in the front row whipped their heads around to look at him and erupted into giggles, saying Abou sounded like a monkey's name. That incident prompted him to adopt his stage name "Wolf" -- a nickname earned playing high school basketball. But as he got older and built his music career, Wolf drew inspiration from his father, which caused him to reflect on his origins and the beauty of Lebanese culture. News reports about the Middle East after 9/11, however, portrayed Arabic peoples in a way that did not match his own experience -- the music and dance, and the "crazy" parties his parents would throw. "It was only when I started with my music that I realized I could start being an ambassador. I could be the guy to show that, hey, we are cool." By incorporating Arabic beats and rhythms into his songs, Wolf says he is introducing North American youth to Arabic culture, turning the strange and foreign into the familiar and popular. His hit Yalla Habibi -- in English "Let's go, my love" -- was the first ever Arabic-titled song to make the Canada Top 40 in 2009-2010. "It's a subtle thing. People don't even realize it's happening. I'm like a Trojan horse -- but in a good way," Wolf laughs. Meanwhile his popularity and recognition are also growing in the Middle East. In addition to being named one of the world's most influential Arabs in 2010 alongside the likes of billionaire Saudi Prince Alwaleed bin Talal and Ibrahim Dabdoub, CEO of the National Bank of Kuwait, Wolf was the opening act for the launch of MTV Arabia in 2007 and performed Yalla Asia -- the official song for the 2011 Asian Football Confederation soccer championships. Centuries of mistrust between cultures won't be overcome with a song or two. However a new generation on both sides is listening to an artist whose music and personal history represents a fusion of two worlds. Sometimes one experience in common is enough to start a conversation between strangers that can lead to understanding and friendship. 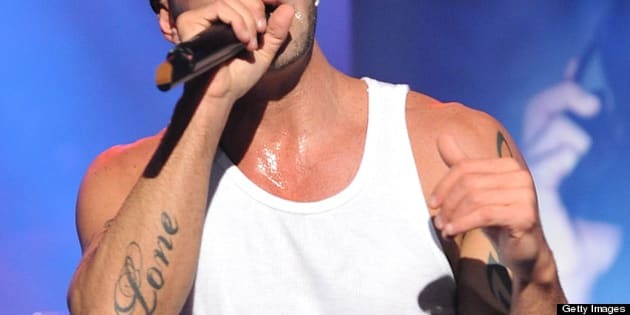 Karl Wolf will perform for thousands of young Canadians at the National We Day in Gatineau, April 29.